In what would seem like a "ripped-from-the-headlines" premise, 'Calexit' from Matteo Pizzolo (GODKILLER) and Amancay Nahuelpan imagines just that and the results surprisingly compelling, smart and tense. Heavy on action and world building but not on the politics themselves. This is an urgent and timely story that comes across as a dystopian thriller that serves as an ugly mirror to our current society. Through Matt Pizzolo's editorial at the end of this super-sized issue, we learn 'Calexit' was planned long before a real campaign for California to secede was started after the presidential election. It's through happenstance that the comic is as relevant as it is considering the giant f-you the state gave to the presidential candidate that won, losing California by 4.3 million votes. This disparity breeds a resistance movement, the majority emboldened by the state's standing in the world as the sixth largest economy, with industries that feed the nation, create the latest technology and entertain billions. The president calls in the National Guard to maintain the peace and enforce the law. It's a powder keg of violent tension up and down the state. It would seem a story like this could be dragged down by its political overtones and seemingly fascist motivations but it doesn't. In fact, Pizzolo smartly picks an unlikely character to guide us through this post-secession landscape. Jamil calls himself a courier, some say he's a smuggler, willing to transport just about anything for a price and he traverses the streets of Hollywood and its Hills introducing us to the new world order as armed Homeland agents patrol the city. He provides some laughs which help lighten the mood of what could have been a heavier politically-charged story. This is a near-future dystopia where the most wanted freedom fighter, Zora, is being hunted down by Homeland forces and its psychotic leader, a Steve Jobs doppleganger. And Jamil is about to come in contact will all of them. 'Calexit' works on multiple levels but can be described as a low-down dirty, street-level, version of Greg Rucka's great dystopian thriller series, 'Lazarus,' over at Image Comics. Where that series concentrates its attention with those in power and their amazing Lazari, 'Calexit' follows the resistance from the ground creating a combustible atmosphere of politics, drugs, violence, corruption, and fascism. And does it all while being entirely entertaining. It's not heavy-handed but totally riveting. Amancay Nahuelpan provides a dizzying array of perspectives, angles, and layouts that are detailed and imaginative. Nahuelpan's strengths are the subtle and not-so-subtle expressions, glances, looks of menace and body language. In such a tense environment with highly charged moments, the art needs to be precise and convincing, Nahuelpan with Tyler Boss' subtle colors deliver a tour de force of visceral action. 'Calexit' is smart, funny, and electric. The politics only lay the groundwork for a fully realized dystopia that seems closer than we think. The graphic violence and shady characters make this more an action movie than a political thriller but there are layers upon layers within the story. It never ceases to surprise with wit and sly social commentary. Oh, and it's entertaining as hell too. 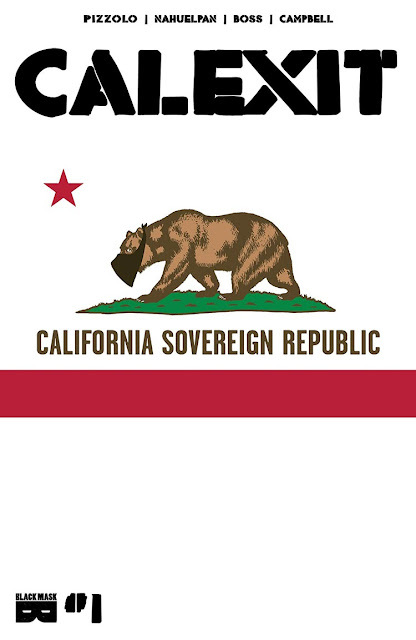 'Calexit' is a book that captures our times and holds up a funhouse mirror of horrors to it. This is timely and a must-read.